Les Miserables premiered on Christmas day setting a record for audience attendance on a musical opening on a weekday at over $18 million in sales. Les Miserables has already been nominated in several Golden Globe categories including Best Actor: Comedy or Musical (Hugh Jackman), Best Supporting Actress (Anne Hathaway), Best Picture: Comedy or Musical, and Best Original Song (Suddenly). It was also directed by Oscar winner Tom Hooper. There are many predictions on which Oscar nominations this film will garner as well, but the public won’t find out until the nominations are announced on January 10, 2013. 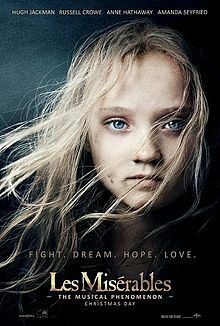 Les Miserables is notable in that this is the first film adaptation of the musical. The film had a story adaptation in 1998 with a luminous cast including Oscar nominees Liam Neeson and Uma Thurman and Oscar winner Geoffrey Rush. The musical was a hit starting from its premiere in 1985 and it became the fourth longest running musical on Broadway. To capture eligibility for 2012 Oscar awards, Les Miserables premiered Christmas Day along with several other films looking for the same accolades, like Django Unchained and West of Memphis. The record audience attendance was a pleasant surprise, but certainly welcome given what is sure to be a large, but unreported budget. It’s a sprawling cinematic story with a huge cast and the likes of Jackman, Hathaway and Russell Crowe don’t come cheaply. Rounding out the cast are three more top notch performers – Sacha Baron Cohen, Amanda Seyfried and Oscar nominated Helena Bonham-Carter. Les Miserables didn’t just catch a record audience on its premiere Christmas day – it is still a box office champ pushing for a sales record for any film musical. It’s already at number 25 after just two days in theaters with over $30 million. Number one is Grease with just over $180 million in receipts. Are you happy the musical has finally been made into a film or should it have stayed on the stage? Let us know in the comments below!